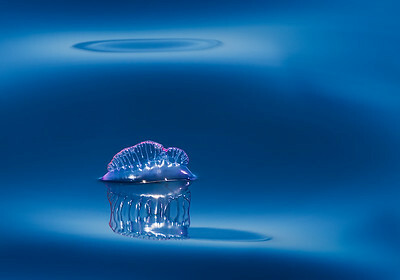 My Highly Commended Portuguese Man o' War and my Shortlisted 4-image Portfolio of Mount Pico. 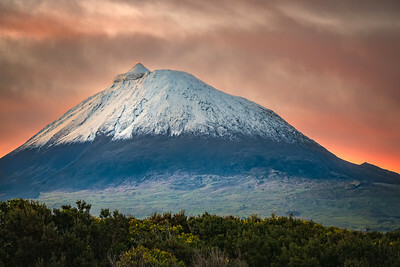 All pictures were taken in the Azores, where I live. Obrigado! Also, FINALIST IN WILDLIFE, SEALIFE CATEGORY. Often incorrectly defined as jellyfish, the Portuguese Man o' War is a siphonophore - a colonial organism. While the bell is harmless, their tentacles can deliver very painful stings! I noticed the Man-o-war floating close to our boat and decided to take a shot. While I was instantly pleased about my picture, it was only later at home that I realised I had got an image with a very abstract mood from a 100% real photograph. Very calm seas and occasional smooth, non-breaking wavelets led to the unexpected multiple reflections. Cloud turban on Mount Pico, a volcano that last erupted in 1718 and is currently dormant. Technically, cloud hats are lenticular clouds and this one instantly reminded me of a turban. I would have missed the shot completely if it had not been for my wife. That day, at sunset, I was working on the computer when she phoned me from work and yelled – Have you seen the Pico?! – I rushed outside and could not believe my eyes, to the point that I thought it was too good to be true, that the cloud would certainly dissolve before I had a chance to grab my camera and put it on the tripod. Luckily, it did not. Sunrise on snow-capped Mount Pico, mid-Atlantic. Locally known as Montanha do Pico, this mountain is such an outstanding feature that the island where it is located bears its name. Rising literally from the abyss, Pico Island enjoys a mild climate, partly due to its latitude (38°N) and partly to the mitigating effect of the Gulf Stream, making the contrast between the island’s warm climate and its snow-capped volcano truly remarkable. However, what I really hoped to capture in my image is how serious and dramatic Mount Pico looks even when out of its island context, instantly recognisable by its beautiful signature profile and even showing here a tiny cue of the fumarole on the summit. Fumarole on Mount Pico, the highest peak of Portugal (2351 metres). 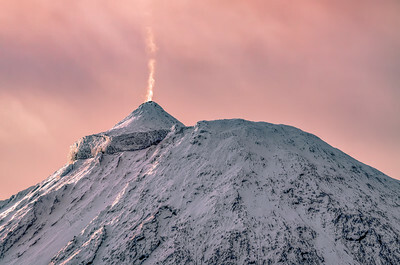 This dormant stratovolcano is located right in the mid-Atlantic and its fumarole is more likely to be observed in winter and early spring, when cold air maximises the difference in temperature between the expelled gases and the environment, allowing enough water vapour to condense. On the other hand, clear skies and very weak winds are also needed to make the phenomenon clearly observable and these are less likely to occur in winter and spring. This explains why, overall, the fumarole on Mount Pico is very rarely seen, let alone photographed. A lucky sunrise in spring, out of dozens of unsuccessful ones, finally allowed me to capture it. 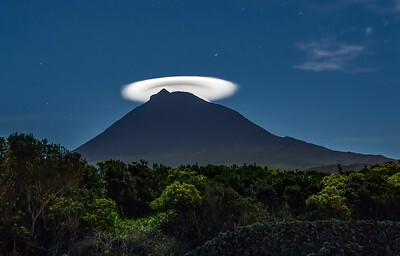 Night shot of Mount Pico wearing a perfect hat. If lenticular clouds are rare, well-defined ones are even more so. In general, they form very rapidly and, due to the high air turbulence, the changes in shape are so abrupt that they sometimes look like time lapses! I was very lucky to be able to capture this one with my camera, as the cloud just kept spinning around the top of the mount during the 30 seconds I needed for my exposure, rather than losing its definition and diffuse. 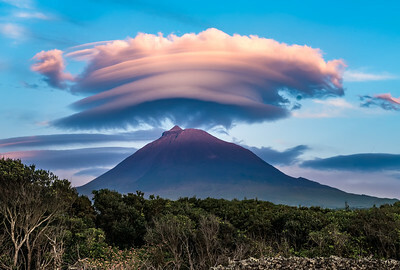 Ten seconds later, the cloud started to descend along the slopes of the volcano, completely covering the summit of Mount Pico. This is by far my luckiest shot ever for timing.